Since I already told the story of my friendly history with Nathan Salsburg in my review of his Avos duet LP earlier this year, I’ll cut right to the chase in talking about the compelling music on Affirmed, which is the Louisville-based guitarist’s debut full-length as a soloist. Salsburg’s picking is clean, confident, and sometimes even a bit flashy. These eight upbeat and melodic tracks clearly indicate that Salsburg is a fingerpicker with little to no interest in the down-tuned, borderline new age exotica being explored by so many of his peers… and Affirmed sounds all the better for it. Opener “Sought & Hidden” sets the tone: bouncy and upbeat, Salsburg throws down a strong alternating bass with nimble melodic figures in the middle and upper registers. Like most of the tracks on the album, “Sought & Hidden” is highly composed with a strong narrative quality in the way the song unfolds. The primary theme is probably the most “minor” sounding of the entire record, though the mood here is anything but dark. “New Bold Ruler’s Joys” picks up the pace a bit. This jaunty rag-blues originally appeared on one of Tompkins Square’s Imaginational Anthem collections, and this newer recording is more or less faithful to the original rendering. This track has a pleasing sophistication to it, with some very cosmopolitan jazz chords and cadences. The titles “Back Home In Bogenbrook” and “Fraught With Hornpipe” both seem to hint at Salburg’s longtime interest in British Isles traditional music, though this isn’t prominently expressed in the sound (while we’re on the subject, though, I highly recommend the recent release Whaur the Pig Gaed on the Spree, a collection of Lomax field recordings of Scottish traditional singers, curated by Alasdair Roberts and released on Salburg’s Twos & Fews imprint). “Bogenbrook” does begin as a quasi-aire, but quickly switches time signatures and takes up the familiar Salsburg lilt… the “C” section finds him ragging the blues once more, displaying a very impressive intuition for and control of the style. The opening melody of “Fraught With Hornpipe” sounds like a hybrid of Irish and Appalachian dance tunes, which soon gives way to a progression of chords with a long descending bass line. “Blues For Eight Belles” is another joyous boom-chicker, with a more or less identical tempo to “Hornpipe”. This tune has echoes of the classic Piedmont blues of “Vestapol”. At this point in the album, the guitarist has firmly established his sound, and one begins to wish for a little more variety in the presentation of Salburg’s playing. Though “Eight Belles Dreamt The Devil Was Dead” has a more sentimental melody than many of the other tracks, the effortlessness of Salsburg’s picking begins to blur the tunes on the album together… too much of a good thing? A welcome change of pace comes with “The False True Love”, Shirley Collins-approved and the lone vocal track in the set. The sound of the guitar, captured in multi-mic, hyper-realistic detail on the instrumentals, is here placed further back in the mix, giving the tune a more “live” sound than some of the others. Salburg’s plain, unaffected vocal delivery puts the song across with aplomb, and the addition of harmony vocals from Julia Purcell, as well as Matthew Schreiber’s accordion finally give the album the additional texture it needed. Not for nothing, but this track would sit perfectly well on adult alternative radio, alongside the M.Wards and Gillian Welches of the world. I see more recordings like this in Salsburg’s future. In my opinion, this album could’ve benefitted from another vocal song or two, clocking in as it does at just over a half-hour… I happen to know that the man has an absolutely stellar Archie Fisher tune in his bag, and I’m officially going to start campaigning for a recording right now! “Affirmed” ends the album in confident fashion. The melody is one of Salsburg’s most animated, which is really saying something, replete as it is with tumbling runs all over the fretboard, and little nods to classics like “Cocaine Blues”. I’ve heard and studied many of today’s young guitar pickers, and I can say with confidence that there’s nobody who plays quite like Nathan Salsburg, and few players even begin to approach his high standards of composition and performance. There isn’t a whole lot of variety on Affirmed, but despite that fact, these tunes are pretty much all winners. 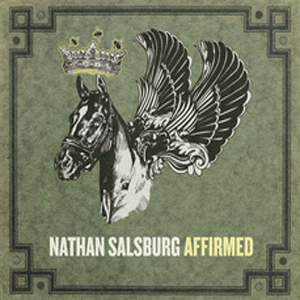 If you’re a fan of acoustic guitar music, you can’t really beat the 1-2 punch of this record and the aforementioned Avos LP… and from all indications, this is just the beginning for Nathan Salsburg! Huzzah! This entry was posted in Reviews and tagged Acoustic, Affirmed, Alasdair Roberts, Alternating Bass, Boom-chick, British, Fingerstyle, Nathan Salsburg, No Quarter, Twos & Fews on November 19, 2011 by Work & Worry. Love these recordings – broke a couple of strings just trying to work out the tuning on the track, Affirmed (Db-Ab-Db-F-Db-F…? ).